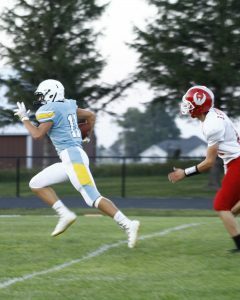 The Lynnville-Sully football team is off to a strong 3-0 start after a convincing victory over North Mahaska on Friday, Sept. 8. Hosting the Warhawks, L-S won in dominating fashion, 54-14, and never trailed during the game. The L-S boys earned their third win of the season while the Warhawks lost their fourth straight game. The key to the Hawks scoring so many points was their ability to get multiple athletes in open spaces. L-S really got rolling in the first quarter with three touchdowns. Senior Elijah Collins connected with classmate Tanner Foster on a 25-yard pass play for a touchdown just minutes into the game. The PAT kick was no good, but the Hawks were at least on the board, 6-0. Senior Tanner Foster leaps up to catch the ball and score the first touchdown. With 5:53 left in the quarter, junior Gage Van-der Leest ran 34 yards to the end zone. After a failed PAT run, the scoreboard read 12-0 with the Hawks up. The L-S boys struck one more time in the first quarter with a pass from Vander Leest to senior Drake Ehresman on a 40-yard touchdown play. This time, senior Brevin Hansen’s PAT kick went through the uprights as L-S went up 19-0. The Warhawks finally got on the board with a touchdown four minutes into the second quarter. 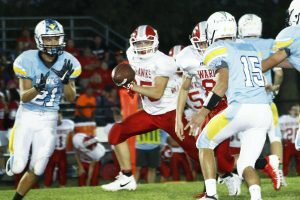 The Hawks were successful in stopping the North Mahaska PAT run, however, and then answered back with senior Brevin Hansen returning the ensuing kickoff 81 yards for a touchdown. Senior Sage Zylstra ran in the ball for a successful extra two points, and L-S led 27-6. The Hawks scored two more times in the quarter on passes from Collins to Hansen. One PAT run was stopped and one PAT kick was successful, so the Hawks went into half-time ahead 40-6. L-S scored two more times in the game, both in the third quarter. One was a 33-yard run by junior Nate Stock with a successful PAT kick, and the other was a two-yard run by Zylstra with another successful PAT kick. The final score of the night came from North Mahaska on a run play with 5:05 to go in the fourth quarter. Their successful PAT run brought the final score to 54-14. Senior Drake Ehresman races to the end zone. The leading rusher for the Hawks was Stock, who had six carries for 67 yards and one touchdown. Zylstra also had one touchdown while going for 58 yards on seven carries. The passing game also clicked for the Hawks on Friday with senior quarterback Elijah Collins throwing for 63 yards and three touchdowns. 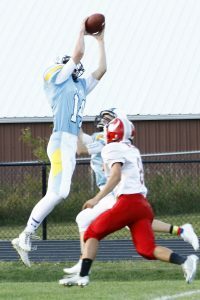 Collins’ main targets were seniors Hansen and Foster. Hansen had two catches for 38 yards and two touchdowns while Foster had one touchdown catch for 25 yards. Vander Leest also threw the 40-yard touchdown pass to senior Drake Ehresman. Once again, the Hawk defense was dominant. The leading tackler was senior defensive end Kemper Lukehart. He racked up eight tackles, including one sack. Junior linebacker Grant Wehrle also had a solid night on defense with seven tackles. This Friday, L-S (3-0) travels to Cardinal (Eldon) to play the Comets. The Comets are 1-2 on the season after beating Winfield-Mt. Union 14-6 last week.